I love Spain, and I love Spanish tapas. My favourites are the Basque style pintxos, small crispy slices baguette with delicious toppings. In Sitges, Eguzki-Lizarran is definitely the place to enjoy this specialty. Eguzki-Lizzaran is located in Sitges city centre, in a narrow street a few hundred meters away from the beach and from the railway station. It is easily accessible by foot for those staying in the city, as well as those visiting from Barcelona and other destinations. Placed on a corner, you can get a glimpse of the Mediterranean through the gap in the narrow street. 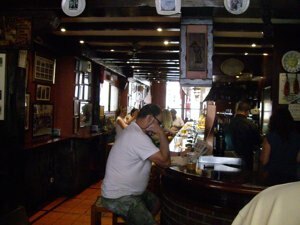 Eguzki-Lizzaran offers a traditional tapas restaurant / bar interior, dominated by dark wooden walls, floors and furniture, decorated with a large number of different items. You are seated either by the bar or on low stools, not very comfortable and very close to neighbouring tapas enthusiasts. The food is based on self service, i.e. 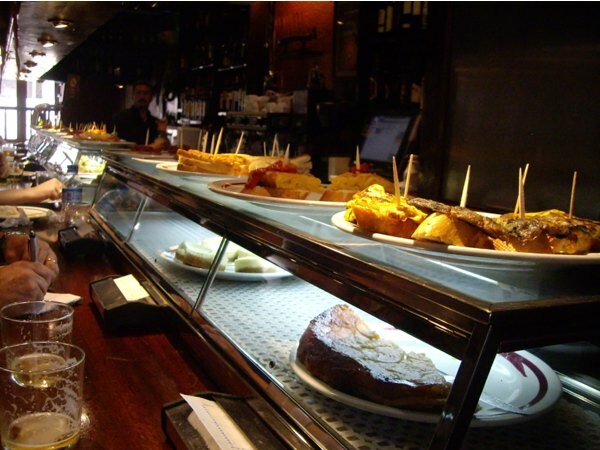 you order your beverage first, and then you choose your tapas or pintxos by the bar. Places like Eguzki-Lizzaran are often crowded, and the access to the food counter may be difficult. The service is therefore not necessarily the best, but the food is worth fighting for. Basque pintxos is my favourite bite-sized foods. The toppings are different from place to place, and I think that Eguzki-Lizzaran offers one of the best selections in Sitges. Here are a few pictures with delicious images to drool over. Pintxo with onion, bechamel sauce gratin was a completely new pintxo for me. Fried onion immersed in a rich white sauce topping, and gratined in the oven. 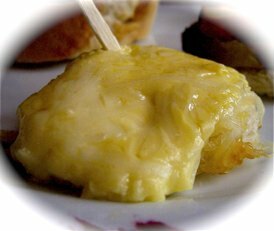 I loved the sweetness of the onions, the creamy bechamel in the golden, slightly crisp cheese on top. One of my favourites at Eguzki Lizzaran. . I simply love Spanish croquetas. These creamy dumplings made from white sauce flavoured with cheese or jamon serrano, rolled in bread crumbs and fried in hot oil. Deliciously, deliriously crispy on the outside and equally deliciously, deliriously creamy on the inside. Ham croquetas are served on a slice of crispy bread at Eguzki-Lizzaran and are as delicious as when served as a separate tapas dish. 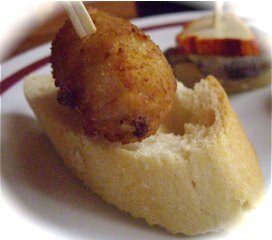 Pintxo with cheese and fried mushrooms is a completely new, unknown topping presented at Eguzki-Lizzara. 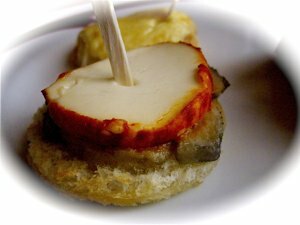 Different styled cheeses are part of many pintxo-toppings.This cheese was softer and creamier than the harder more matured Manchego cheese, and it was served on a lice of fried mushrooms. Delish! 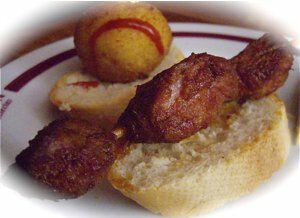 Pintxo with meat skewer is another traditional tapas-dish served pintxo-style. A deliciously tender meat skewer served on a thick slice of baguette. In the US you are often served jalapeno poppers as bite-sized bar grub. Pintxo with green jalapeno stuffed with cheese is certainly its Spanish counterpart. Green hot peppers are often served fried with salt, called "pebrtos del Padrón" (catalan) or "pimientos del Padrón" (spanish). 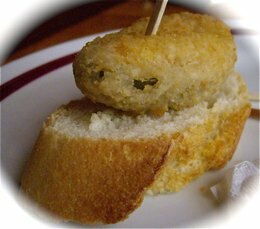 This pintxo is topped with one large green chili filled with creamy cheese, rolled in breadcrumbs and fried in oil. Delicious crisp on the outside, creamy and hot filling. 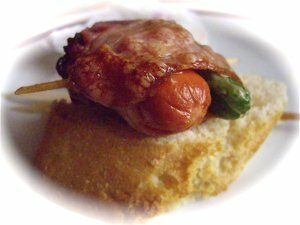 Pintxo with bacon, sausage and asparagus: A spicy sausage and a tip of green asparagus wrapped in a slice of crispy bacon and served on bread. Another innovative topping that I have never seen before, but served at Eguzki-Lizarran. And then it's a question what to drink. 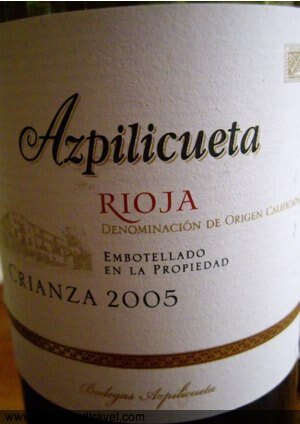 During a warm summer day, a cold beer is the obvious choice to quell your thirst, as well as a chilled white wine. We, however, settled for a bottle of Azpilicueta, a Rioja Crianza from 2005, a blend of Tempranillo - a perfect red wine matching the food very well. We loved the pintxos served at Eguzki-Lizzaran, and when the waiter counted through the long and short sticks holding them together (and which are effectively a price tag per item as well), we ended up paying a ridiculous price for a very good and filling meal.